Recruit an apprentice allows both levy paying employers and training providers to advertise on Find an apprenticeship (FAA). 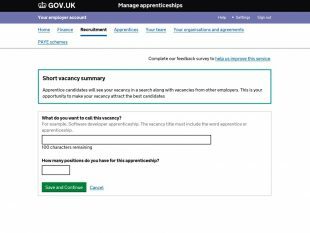 The average time spent by citizens looking at a vacancy, is 1 minute 56 seconds, therefore we would advise employers to tailor their apprenticeship vacancies to ensure the key information above is available. For more information on how levy paying employers can advertise their own apprenticeship vacancies watch our recorded webinar on our YouTube playlist ‘Using the apprenticeship service’.